This elegant class of camera combines advanced features and Nikon SLR image quality with a compact, lightweight, titanium body. breaks down too easily and no repair parts available -even from Nikon ! breaks down too easily and no repair parts available - even from Nikon ! broken Printed circuit board (short) and no parts to repair ----dead end from all recognized repair facilities even fron Nikon ! One of my choice for the compact/rangefinder cameras. I think the best in market together with Nikon 28ti and to be honest I like the Fujifilm Klasse but can't say is the best as I didn't use yet, hopefuly soon. I like this camera more for the analog display on top instead of digital one. It's well performed, clever flash professional features,data etc. 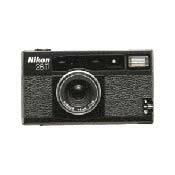 Simply you need to own this if you still fancy 35mm and trying to avoid using big SLR cameras. Leica Minilux, Contax TVS(II), Ricoh GR. I would say that I've messed up more shots with this camera than any other. It's really easy to accidentally turn on data imprinting, which basically prints the date on the image, and tells you nothing of exposure or camera settings. Very annoying. It's also very easy to accidentally slide the panorama slider across, which masks off the top and botton of the frame - also very annoying. Another very annoying thing is the fiddly menu system for changing things like the metering mode or flash beviour. I actually have the settings printed and laminated in credit card size for my wallet. The meter also needs to have two thirds of a stop underexposure permanantly dialed in for slides, which is fine becasue at least it's predictable, and setting remains even after the camera has been switched off. It also badly underexposes in low light, compared to any of my other cameras. Did I mention the flash bottons? Very annoying. As is the flash recharge time. This was a great camera for snapshots, but highly unreliable. Mine has broken down at least twicw and hasn't operated for years. I expected more from a Nikon. I've owned this camera only a short time and already I use it much more than my F3. It's nice having manual controls or point and shoot convenience is such a compact, quality camera. Good lens, great-looking design, sturdy feel. Expensive, eats batteries, design hampers use. Don''t kid yourself about this one. Yes, it is beautiful to look at in a mysterious sort of way. But it''s just a good, not a "great" picture taker, and its classy design sometimes (too often for me) negates its functionality. The instruction booklet - over 100 pages of it - is a depressing necessity when adjusting the simplest functions. You''ll find yourself having to refer to it over and over. The button switches were designed for people with exceptionally long fingernails or pencil-thin fingers. The lens is sharp and the AF is usually right-on, but this is also true of the much less-expensive Olympus Stylus. The battery drain on this camera is just absurd, or criminal, depending on your point of view. So yes, it looks great. Get one, hold it in your hands, and marvel at its amazing design. If you''re a gadget person, you''ll probably get one anyway - just to play with the dials. Wide variety of point and shoots. EATS, and I mean just freaking gobbles, batteries. Flash recycle is slow. Best point-and-shoot around; but I''m pretty Nikon brand-loyal. Exceptional color and contrast. Looks cool. Good control, or effective in point-and-stupid mode. Matrix metering is surprisingly good. I spent two weeks in France with it this year - decent, but next time I''d take one of my Nikon SLRs. First this is my first camera that really go into repair twice. First, the falsh is always under exposure. Then it happened again 2 months after it fixed. The other weaknesses is the custom mode which is impossible to set without camera manual. The button for fill flash is also too small (It is corrected in 28Ti). Also be prepared with the needle misallignment (happened twice also) which will required another manual searching on how to fix it. The camera is very nice to use but on long travel don't forget to bring the manual book, just incase the needle missalign, and the custom function is change accidently.